This is the first of a series of tutorials on how to create a layer using the current Layar developer API . Each tutorial will explain how to implement a specific feature within a layer. Sample code is also provided at the end of each tutorial. The idea is to help developers get started with their layer development faster. In this first tutorial, we explain how to create a simple geolocation layer step by step. A geolocation layer returns POIs which are located in a specific geo-location. Please NOTE that only the minimum required code for creating a geolocation layer is explained here. A more generic and complete version is provided in the Sample code. Please NOTE that the web server should be publicly reachable on the internet. After logging in with your layar account, the developer can define a new layer by clicking the "Create a Layer" button under "layers" section on the publishing site. 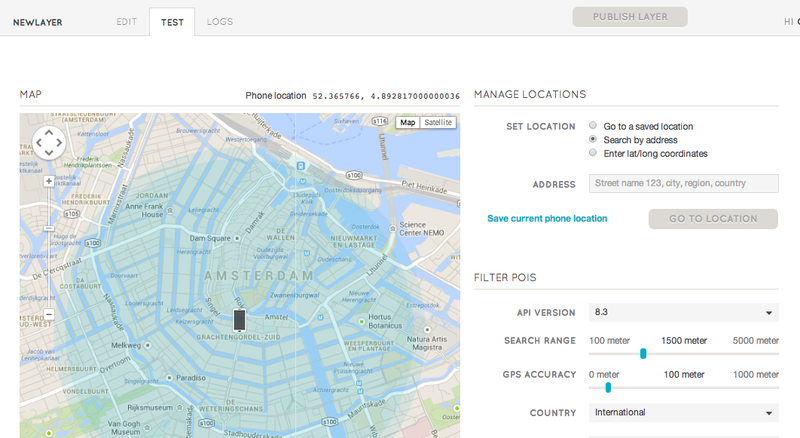 In this tutorial, we create a layer which shows the location of the Layar office in Amsterdam as an example (see sreenshot below). More details of defining a layer can be found here. 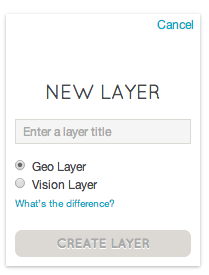 After completing the form, click "Create layer" button and the layer appears in the layer list. Click on "Edit" button to further customize this layer. In layer editing section, there are quite a few tabs. In the table below, we highlight the needed customizations for this tutorial in the table below. The rest can be left on their default values. For more detailed description, please read here. Listing & Indexing Icon We upload a layar icon image. Detail description Fill in "This is a layer which shows the location of the layar office in Amsterdam. It is a tutorial on creating a simple layer.It is created by Layar Technical Support." Look & feel Banner Icon Upload a banner icon(60x26). Coverage Countries Only list countries that this layer covers. Here we choose "Netherlands"
Bounding Boxes If POIs are only available in a city or specific region. Bounding boxes can be used to define that region. A layer with bounding boxes will be shown in the local tab when the user is in the defined region. In this layer, we set bounding boxes around Amsterdam. After defining a layer on the publishing site, we can prepare the database that stores the POI information. We shall use a MySQL database with phpMyAdmin. In this tutorial, a table called POI is used. More tables will be created in the coming tutorials to enable more advanced features, such as actions, 3D objects, etc. Please NOTE that since getPOIs API v6.0, it is possible to support both geo POIs and vision POIs. We added a field called "poiType" which has value either "geo" or "vision". We will use this field to distinguish these two types of POIs. More fields will be added to this POI table in future tutorials. When the "POI" Table is ready, we insert POIs into it. Google Maps is used to get the GPS coordinates for selected locations. You can also use other tools for this. Search for "layar, amsterdam" at Google Maps. Right click on the icon on the map and press "What's here". The Geo coordinates (latitude, longitude) will be displayed in the search field. In our case the coordinates are (52.374518, 4.9353). Add the POI information to the POI below. The remaining fields are left as default for now. Now that we have a POI in the database, it is time to build up a web service to fetch the POI information and return it back to the Layar platform. The returned POI information should be formatted in JSON. If PHP version 5.2 or above is used, JSON is supported natively. Otherwise, the JSON string needs to be constructed programatically. firstTutorial_simplified.php - the main php script file which is called by Layar server. It is the same file as defined under "API endpoint URL" field mentioned above. In the layer definition, we have provided the POI URL which will be called to retrieve the POI information. Let's have a look at the PHP script. layerName - The name of the layer defined on the publishing site. lat - The latitude of the position where the user/phone is located. lon - The longitude of the position where the user/phone is located. radius - The search range within which POIs should be returned. Then, we use $_GET, a php global variable, to retrieve these parameter values. The needed parameters are stored in an associative array named $requestParams, which has parameter name as key and parameter value as value. This is done by calling a custom function getRequestParams(). Set up the connection to MySQL database and select the database which contains POI table. In our tutorial, we use PDO, a PHP extension, to formalise database connection. For more information regarding using PDO, please see http://php.net/manual/en/book.pdo.php. Once the database is connected, we can retrieve needed POI information. We created a custom function called getHotspots() to do so. Now we are going to create a SQL statement to retrieve POIs information from POI table. Only POIs within the defined search range (in our case, "radius" returned from the GetPOI request) are fetched. Returned POIs are sorted by distance and the first 50 POIs are selected. The calculation of the distance (in meters) between two locations is based on the Haversine formula. Please NOTE that this way of calculation is not scalable for querying large databases. For each POI, we only return mandatory parameters and optional parameters with non-default values defined for POI object. Please NOTE that only return mandatory parameters and optional parameters which have different values than their default values. In our tutorial, we use a combination of PDO::prepare() and PDO::execute() to prepare and execute the SQL query. These two PDO statements are used due to security reasons and will help prevent general SQL injection attacks. Sort out retrieved POIs information and put them in $reponse["hotspots"] associative array. the distance between POIs and the user is within the "radius" returned from GetPOI request. Returned POIs are sorted by distance and the first 50 POIs are selected. The distance is caculated based on the Haversine formula. Note: this way of calculation is not scalable for querying large database. // Use PDO::prepare() to prepare SQL statement. // This statement is used due to security reasons and will help prevent general SQL injection attacks. // will be substituted when the statement is executed. // get anchor object information, note that changetoFloat is a custom function used to covert a string variable to float. Now we have defined getHotspots function, we can use it to retrieve POI information and construct JSON response. errorString: String; The corresponding error message returned back to the user, visible in the AR view. For detailed information, please read the readmefirst.txt in the attached Sample Code folder first. API test page: It is available on the publishing site next to each layer. The test man can be placed anywhere your POIs are located. In our case, we just leave it as default. After adjusting the search slider to the right position, press "Load POIs" button to retrieve POIs. On the phone: Layar application is currently available on Android(version 2.2 and above) and IPhone(3GS and 4). Before request publication approval, please make sure that you test your layer against Layer testing instructions . 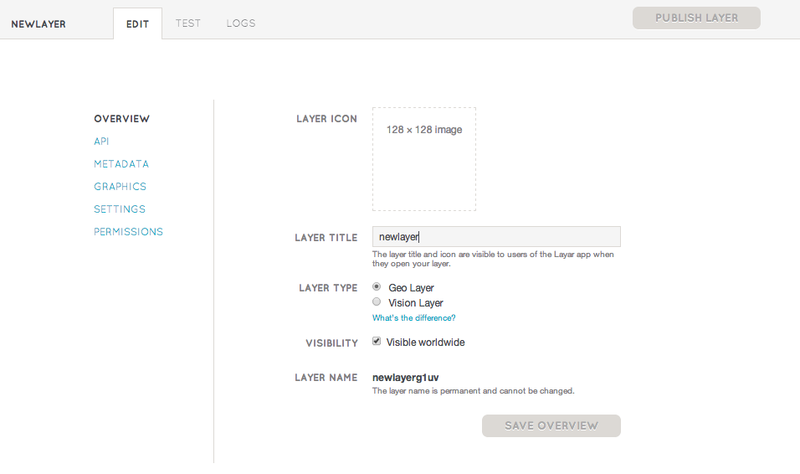 Once your layer is approved, you can publish it to make it visible to the users. To publish the layer, you can press the "publish" button next to each layer under "layers" tab on the publishing sit. For more information, please read Publishing site. This is the end of our first tutorial, get started with your first layer and impress us!! For any technical questions, please visit Layar Developer Support Environment. The Layar developer community is there to help you out!